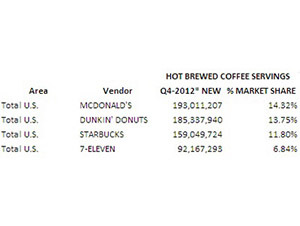 7-Eleven: Fourth-Largest Seller of Coffee in U.S.
DALLAS -- Convenience retailer 7-Eleven Inc. has the fourth-largest share of hot-brewed coffee servings in the United States, trailing behind three other household names, according to 2012 yearend data from StudyLogic. Dallas-based 7-Eleven owns 6.84% of the coffee market in the U.S. with 92.2 million servings reported in the fourth quarter of 2012, according to StudyLogic. A 7-Eleven spokesperson would not confirm the data and declined comment on the report. McDonald’s is the leading coffee seller, according to the report, with 14.32% of the market and 193.0 servings sold in Q4 2012. Second place goes to Dunkin’ Donuts with 13.75% share and 185.3 million servings, followed by Starbucks with 11.80% share and 159.1 million servings. The order remains the same when viewed by coffee dollar sales, though 7-Eleven’s $156.7 million in sales in the fourth quarter earned it a slightly larger 7.90% share of the market. McDonald’s: $260.6 million, 13.13% share. Dunkin’ Donuts: $248.4 million, 12.52% share. Starbucks: $237.0 million, 11.94% share. 7-Eleven: $156.7 million, 7.90% share. 7-Eleven coffee is sold in four sizes and a variety of flavors, from 100% Colombian to blueberry to butter toffee, according to its website. In January, the convenience store retailer introduced a Brazilian dark roast, the retailer's "richest, most full-bodied coffee to date," with a month-long $1 Coffee Wednesdays promotion. Cedarhurst, N.Y.-based StudyLogic is a market-data provider for the foodservice industry specializing in tracking and providing total U.S. and local market data. 7-Eleven operates, franchises or licenses more than 9,700 7-Eleven stores in North America.